This program explores the amazing archaeological sites of the Moche and Chimu cultures. In Trujillo we visit the pre Columbian mud brick city of Chan Chan, the majestic Sun & Moon pyramids and the lovely fishermen hamlet of Huanchaco. 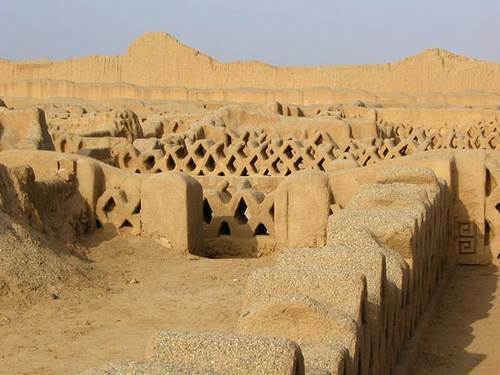 In Chiclayo we have a visit to Tucume Valley, the Cracked Pyramid and the Royal Tombs of Sipan. Today we drive to the airport to take our morning flight to Trujillo. We are welcomed and transfer to our hotel. Free day to explore the colonial city of Trujillo, the third largest city in Peru at our own leisure. Today we first go on a tour around the beautiful churches and well preserved colonial mansions of Trujillo. Afterwards we visit the Huacas de Moche Museum where we learn about this ancient civilization which ruled northern Peru about 1700 years ago. Later we explore the staggered pyramids of “Huacas del Sol y de la Luna” two huge flat-topped pyramids built by the Moche culture between 0 and 600A.D that impress us with their beautiful polychrome friezes. Then we continue to Huanchaco, a traditional fishermen´s hamlet famous for its totora reed boats called locally “Caballitos de Totora”. Finally, after having lunch in a local restaurant we visit the ancient mud-brick city of Chan Chan. Today we take a 3.5 hours drive to the city of Chiclayo. We are welcomed and transfer to our hotel. We have a guided tour through the city visiting churches, republican houses, parks and some other attractions. The tour ends at the witches market which is a very fun experience. In the morning we go on an excursion to the magnificent mud-brick burial platform of “Cracked Pyramid” where the world famous Tomb of the Lord of Sipan was discovered. Incredible gold artifacts and precious stones amaze us while learning of this ancient Moche civilization. Later we continue to Tucume, an imposing 26 adobe pyramids complex which was once the political and religious center of the Lambayeque culture. Afterwards, we visit the brand new Royal Tombs of Sipan Museum to marvel ourselves with the gold treasures and intricate jewelry belonging to the Lord of Sipan which were buried with him for the afterlife. Transfer to the airport to take your flight to Lima.